Remembering World War II in Asia: Dishonest Visions of History? Cold War divisions, now shorn of their ideological pretensions, have achieved a kind of second life in war memory. From the moment World War II ended, its legacy posed urgent questions to those who survived it. The brutality of the preceding years cast doubt on fundamental assumptions about politics, progress, and human nature. What misapprehensions—what unacknowledged evils—inhered in our societies, our sciences, and ourselves? So much of the second half of the 20th century followed from the answers, sincere and self-serving, that each generation offered. This year, 70 years later, we still live in a world haunted by the problems and memories that came flooding back as soon as the catharsis of peace lifted. Nowhere is this truer than in East Asia. On the eve of the war, the region was a mosaic of colonies, extraterritorial concessions, and, running into the South Pacific, a chain of mandated territories controlled by Japan. Beginning with the invasion of northeastern China in 1931, the Japanese military swept away these gradations and brought a vast section of the earth under its dominion. At its height, the Japanese empire stretched from Indonesia in the south to the Amur River in the north, and from Burma on the continent to the Marshall Islands in the Pacific. Just east of the Marshalls, at Midway in June 1942, the Japanese navy lost a decisive battle that halted its advance and initiated the slow, brutal trudge toward unconditional surrender. The violence Japan had inflicted on other Asians—with around 20 million dead in China alone—was redounded upon it, as the United States and, in the waning days of the war, the Soviet Union, closed in on the home islands. In the last year of fighting, 66 major cities in Japan were turned to ashes by an American firebombing campaign that made no distinction between military targets and the general population. Over late spring, the only land battle on Japanese soil took place on Okinawa. Some 100,000 civilians were killed or killed themselves, following commands from the military that forbid surrender. Then came the atomic bombs. As members of a brutal imperial regime with a military prone to atrocities, every Japanese citizen was party to immense barbarism. Yet, as individuals powerless to stop or escape the war that rained destruction down on their homes, they came to possess a reasonable sense of victimhood. That these two realities can exist simultaneously, without eclipsing or offsetting one another, is one reason that remembering the war is so contentious. The other reason belongs to the postwar period. After 1945 the European colonial governments that had been expelled by Japan attempted to return to Asia, but they were soon ejected again by a string of national revolutions. What remained was a region of many new states that were quickly polarized into two camps by Cold War politics. The “separate peace” that Japan and the United Stated entered into with the 1951 San Francisco treaties formalized this division, setting up half a century in which discussion and recollection of the war transpired in relatively dissociated national contexts. The Cold War is over, but the arrangement of territory and alliances that emerged under its sway endures. China and Russia maintain a wary affiliation. South Korea, Taiwan, and Japan are joined less by direct diplomatic affinities than a shared dependence on American military power. These divisions, now shorn of their ideological pretensions, have achieved a kind of second life in bitterly contested war memory. At a time when the generation who fought World War II is dwindling by the year, representations of their experience pervade popular culture, and disputes about its significance are infused into nearly all facets of East Asian politics. The 70th anniversary, in which each country is remembering essentially incompatible versions of the war, has put this abiding animus on display. The People’s Republic of China has been conducting a host of commemorative events all year that will culminate in an enormous military parade on September 3 to celebrate the Communist Party’s victory in (as it is called there) the War of Resistance Against Japan and the Global Anti-Fascist War. That designation implies a Marxian theory about the inherently aggressive and authoritarian nature of capitalism, but in post-socialist China, this feature has often been given less play than the bare fact of Japanese belligerence. This was in evidence in an article published January in the People’s Daily, the Party’s official newspaper, which described the parade as an opportunity to “intimidate Japan.” Since then Beijing has rowed back. It now characterizes the day as an occasion to express international unity and hope for peace. In line with this new posture, several recent articles from Chinese historians have emphasized China’s contribution to the Allied victory. Like the PRC, Taiwan opted to mark the 70th anniversary with its first-ever WWII memorial parade in July. Its purpose, though, was notably different. “There is only one truth,” President Ma Ying-jeou told the troops on the day of the event: “[T]hat the eight-year war of resistance was led by the Republic of China, and the victory was the result of the heroic struggle of the whole nation’s army and civilians’ brave struggle under the leadership of Chairman Chiang Kai-shek.” Ma’s remarks reflect recent scholarly efforts to write the Nationalist Party back into a wartime past from which communist historians have for decades erased them. But this zeal to claim a place for the KMT in the victor’s circle had to be moderated against Taiwan’s interest in maintaining a good relationship with Japan. 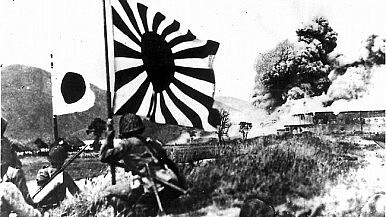 Thus, in advance of the big day, “kill marks”—little rising sun flags denoting the number of Japanese planes shot down—were removed from fuselage of two Taiwanese fighter jets after Japan complained. In Japan, commemoration has been solemn but even more fraught with longstanding tensions. Since regaining office in 2012, Prime Minister Shinzo Abe has undertaken a concerted effort to dismantle Article 9 of the constitution, a cornerstone of the postwar settlement that mandates that Japan will never maintain a military. If he succeeds, it will realize an American objective extant since the 1950s—part of John Foster Dulles “new look,” which envisioned a more economical style of containment built on an apocalyptic nuclear arsenal and the transference of military expenditures to American allies. In the 1950s, Japanese conservatives rejected this program, reasoning that it was wiser to let America handle security while Japan invested its GDP in economic growth. But the calculus began to change during the Gulf War. Japan’s refusal to send troops to Iraq piqued the politician Ichiro Ozawa to complain that the fetters of Article 9 prevented Japan from being a “normal country.” Abe has taken over Ozawa’s complaint, packaging it with a reactionary basket of constitutional and educational reforms. No longer is a “normal country” sufficient; Abe aspires toward a “beautiful Japan” and is pursuing his vision by simultaneously deepening U.S.-Japan military ties and instituting a domestic right-wing agenda. These circumstances have caused a great degree of attention to be focused Abe’s upcoming memorial address. The apology delivered 20 years ago by Prime Minister Tomiichi Murayama set the standard for official Japanese contrition. On August 14, one day before the 70th anniversary of Japan’s surrender, whether Abe uses the word “apology” or simply expresses “remorse” will signal to those in the know whether he is meeting Murayama’s benchmark or not. Somehow, this has been billed as historically important. It may be for a week or so after Abe’s address, particularly if he offends China and South Korea, but all that is really being measured it what Abe thinks he can get away with. And for this, the crucial factor is not how Abe or his Liberal Democratic Party thinks about war history. From its founding in 1955, the LDP has consistently behaved in ways that suggest a minimal sense of responsibility for the cruelties of the wartime state. What matters instead is Abe’s gauge of Japan’s relationship with the United States, and here there are signs that he has some leeway. The Obama administration announced its “pivot to Asia” three years ago. In the time since, this policy, although vague by design, has failed to manifest as anything that does not look like an effort to check China. The Trans-Pacific Partnership, the White House’s unthinking attempt to block the Asian Infrastructure Investment Bank, and the 2015 U.S. military strategy—which lumps China in with North Korea, Russia, and Iran—all fit the bill. They amount not to a grand strategy for containment but to a sort of lazy doubling-down on a sclerotic Cold War plan that can only conceive of the world in binaries. In this regard, Abe’s actions appear less like a “sea change” in Japanese foreign policy, as some have seen them, and more like banking on a tried-and-true alliance between Japanese conservatives and American military interests. Sometimes the transaction has broached on the explicit, as when a day after Abe made an official visit to Yasukuni shrine, he authorized the construction of a U.S. military base in Henoko, Okinawa. There is a certain irony to all this. A line can be traced from the mid-century critic Eto Jun—who compared postwar Japan’s predicament to what he saw as the unjust subjugation of the American South after the Civil War—through the vituperative Shintaro Ishihara and up to Abe’s current perception of World War II. For Eto and Ishihara, rejecting guilt for the war arose from postwar anti-Americanism. It was an expression of conservative anger at having to occupy a subordinate position to the United States. In Abe’s hands, though, the same historical revisionism is being deployed in the service of a bilateral U.S.-Japan security treaty in place since 1951. To realize this is to understand that nothing about Abe is new. He and his mendacious version of history are rather indicators of a postwar system that, always seemingly on the verge of collapse, will just not die and, for the time being, won’t even fade away. Colin Jones is a Ph.D. candidate in history at Columbia University. Follow him on Twitter.